Derrick Favors didn’t want to look at Friday night’s home opener against Golden State as anything other than just another game. But, deep within, he knew better. He, along with everybody else at Vivint Arena and on planet Earth, knew the Warriors are the defending champs, the outfit by which every team measures itself. Do we have stupid etched across our face? Nice sentiments, but nobody was buying them. Since his ultimate goal is to win an NBA title with the Jazz — “I think we’re pretty close,” he said. “I like where we are right now” — he’s fully aware overcoming the Warriors sooner or later will be a requirement. Meeting up with Golden State on this early occasion, then, was of particular interest to a Jazz team that was curious to fire up their engine and get out on the track to see what their ride can really do. It was not fast enough to beat the Warriors, falling by the ridiculous count of 124-123 — on a last-second tip by former Jazz player Jonas Jerebko. If the game itself wasn’t near perfect — and it most definitely was not — the overall effect was even worse. The Jazz could not find or use a better version of their defense, looking even more tepid than their resistance in the first game against the Kings, to slow the high-powered Warriors enough to enable their attack at the other end to keep up. The Jazz scored 81 points … in the first half, a franchise record. The Warriors had 69. On account of the lack of defense, that lead wouldn’t last, especially as it got physical down the stretch and the Jazz bricked shots. Donovan Mitchell attempted to do his thing. Rudy Gobert tried. Joe Ingles tried. And the bench, so strong the other night, couldn’t boost the frontline guys when they dragged. Dante Exum brought speed and energy, but not in the amount necessary for victory. At one point in the second quarter, the Jazz had Georges Niang, Exum, Alec Burks, Ekpe Udoh and Royce O’Neale on the floor. The Jazz were aggressive early, drawing fouls en route to the basket, shooting 17 free throws in the first quarter alone. But they made mistakes, too, getting sloppy with the ball too often. On the whole, they were not efficient enough to win, making 45 percent of their shots, relying too often on one-on-one moves. Just because they couldn’t do much against the Warriors doesn’t mean they can’t against teams like the Nuggets, the Rockets, the Pelicans, the Spurs, the Timberwolves, the Lakers, the Whoevers and the Whatevers. But contrary to what Favors said, the Jazz were troubled by their inability to step up against the finest team in all of basketball, a title they would like to own one day, one night. That is what this game was really about — the Jazz sending a message to the defending champions and to themselves that 1) they are to be taken seriously, 2) if Golden State doesn’t yet see them as an authentic threat in the West, they had best start, and 3) last year was last year, and this year is this year, a whole different beast. 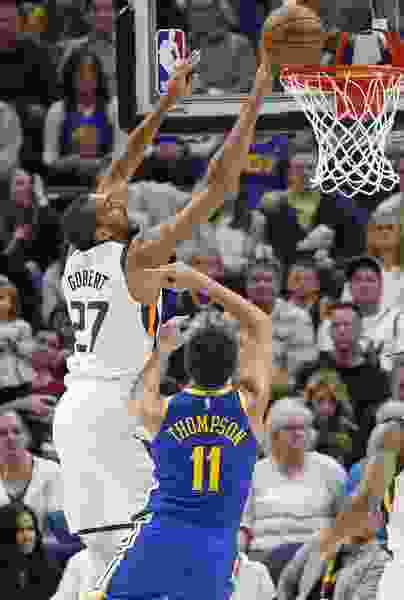 Although the Jazz got no chance to face the Warriors in the playoffs, they remembered that they crushed Golden State in three different regular-season decisions in 2017-18, and those blowouts were not flukes, rather true indicators of what the Jazz are capable. After what happened on Friday night, maybe, maybe not. Like a novice golfer trying to shave strokes off his round, the Jazz achieved that last season, surprising everyone with a run to the Western Conference’s semifinal playoff round. This time, they supposedly are in a more advanced state, like a scratch golfer trying to drop a few more strokes, finding that improvement now to be more arduous. Not talking openly and bombastically about their lofty intentions doesn’t mean the Jazz don’t have them. They wanted to beat the Warriors in the worst way for all the reasons already mentioned. It was just one game near the start of that long season, but … there’s a whole lot more work to do. They could not hold their lead. They could not win. They didn’t hang their heads about the loss afterward, but they noted it in their minds. The Jazz may be one of the best teams in the West, as so many have predicted this season. But the best team, they are not.